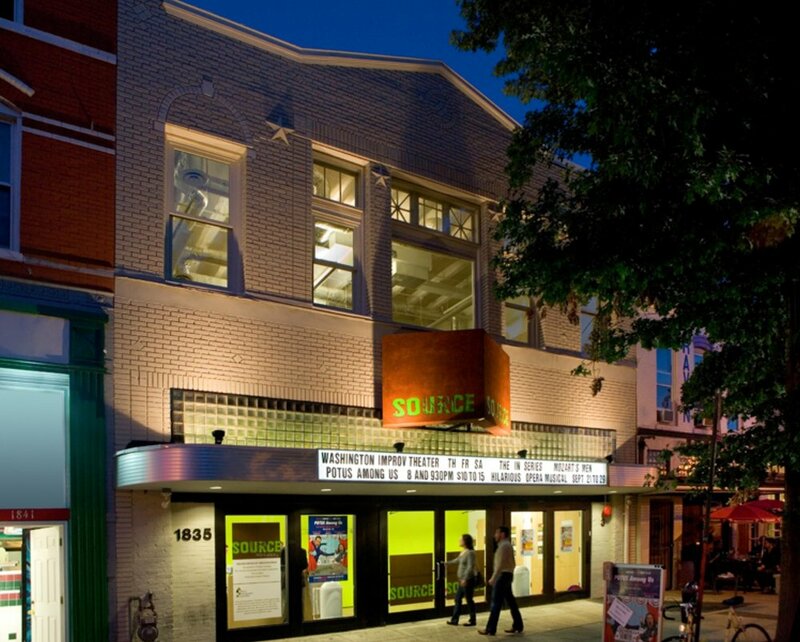 CulturalDC purchased the Source Theatre at 1835 14th Street, NW in October 2006 with the vision of redeveloping the theatre’s multi-use performing arts space. Source’s 150-seat black box is vital to the area’s small and medium-sized arts organizations because the space is intimate, flexible, and affordable. Following an extensive $3.5 million renovation begun in early 2008, Source now provides a classroom, rehearsal studio, and administrative space. Through 2017 it was home to the annual Source Festival, a space for new plays. In addition to the black box, Source houses three resident companies and area performing arts groups that maintain offices on the second floor of the building. Source Theatre Company was a non-profit theater company located in Washington, D.C. Formed 1977, it ceased production in 2002 and legally disbanded in 2006. Closest Metro Station: U St. (Green/Yellow Line); Street Parking: Yes, paid and unpaid. Please note there is a 3 hour minimum. Please state official mission statement of your company. Please describe the type of event you are holding. Please list all other dates and times needed. Please explain with detail how you plan to use the facilities. These are items that can be rented in addition to the space. For detailed tech specs, please contact rentals@culturaldc.org. Please provide the names and titles of your artistic and production staff. Please indicate how many connections you will need. Thank you! We will confirm requests in the order they arrive. Creative community and collaboration are crucial assets for emerging arts organizations and small businesses. As part of the residency program at a CulturalDC venue, companies learn from, and work alongside, their peers, unlocking ideas and creative potential. The organizations below base their operations at Source as part of the Source Residency program operated by CulturalDC. Constellation Theatre Company is dedicated to creating theatre that is epic, expansive and essential. Visionary, expressive design and elevated language are combined with heightened physical movement and ensemble acting techniques. Like bright lights in the dark sky, Constellation illuminates the human experience in ways that are powerful, dynamic and relevant today. The In Series has over a 25-year history of offering a unique and eclectic blend of theatre, opera, cabaret, poetry, performance art and chamber music. Each season The In Series showcases Spanish and Latin-American culture and the In Series is the only music organization in the region that annually produces zarzuela, or Latino light opera. Since its re-founding in 1998, Washington Improv Theater (WIT) has been the fountainhead of a growing improvisational theater scene in the nation’s capital. WIT’s mission is to unleash the creative power of improv in DC and to engage audiences with performances that exhilarate and inspire. The revolution will be improvised. Starting in 2008, CulturalDC produced the award-winning Source Festival, which served as a vehicle for launching new plays and fostering the careers of emerging artists. After a decade-long run, CulturalDC brought the Festival to a close in 2017. Under the helm of Artistic Director Jenny McConnell Frederick, Source Festival became a staple in the DC theatre scene. Everyone at CulturalDC is grateful to the 1,500+ artists that made Source Festival possible for the last decade. We are eager to see what grows from the roots we help plant in the Nation’s Capital and across the country.